One of the most recognizable faces to ever attend Quinnipiac is quickly becoming a familiar and loved face in another country across the Atlantic. Rutty was a staple of the men’s basketball team from 2007-11, leading the Bobcats to their first-ever Northeast Conference Championship game in 2009. After graduating in 2011, Rutty became a professional basketball player in October 2011 in Uruguay playing for a team called Aguada. Following a year of playing in Uruguay, Rutty decided to try his luck in another country and was signed by BBC Nyon of the Ligue Nationale de Basketball A (LNBA). The LNBA is the top league in Switzerland, featuring 12 teams and is split into two divisions, A and B. Players are promoted from the B league, similar to the NBA D League in the United States. Rutty said he decided to play in another country due to his financial situation and that the level of play is also higher. “I learned that basketball is now my job and I have to treat it like that everyday,” the 2010 NEC Player of the Year said. And his decision has paid off. Rutty left Quinnipiac as the NEC’s all-time rebounder. In 19 games in the LNBA, Rutty is also rebounding at the top of the league averaging 12.2 boards per game, three more rebounds per game than the second place player. The 6-foot-7-inch power forward was the second leading scorer his sophomore, junior and senior seasons. But in Switzerland, Rutty’s scoring ability has evolved. He’s averaging 21.2 points per game, which is first in the league. The LNBA league-leader in scoring and rebounds says he hasn’t switched up his method of rebounding since he left Quinnipiac. “It’s similar I just keep on being relentless. I thinks that’s why I’m leading the league in scoring and rebounding,” Rutty said. Rutty, however, did say that the European style of play is more focused on one-on-one’s and isolations which could be the factor to his exceptional play this year. 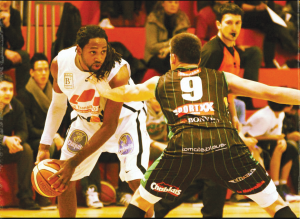 Rutty enjoys his time in Switzerland on and off the court. “I love playing in Europe, Switzerland is a beautiful country and the people here are very nice,” Rutty said. The national language of Switzerland is French although many people also speak English. Rutty is trying to familiarize himself with the language so he can communicate better. “I’m learning French, I spend time with a family twice a week, and every time I go over their house, I can only speak French,” said Rutty, who made more field goals than any other player in Division I at Quinnipiac. The all-time rebounder in Division I history at Quinnipiac still remains in contact with people he played with. “I still talk with the coaching staff and as far as former teammates I try to check in with pretty much all of them as much as I can,” Rutty said on how he can still speak his native language. Although Rutty loves Switzerland, there are some things about it he can live without. As for next year’s plans, Rutty is going to see what happens at the end of the season. The man whose play made his braids and smile loved at Quinnipiac could be even more familiar to the Swiss at season’s end if he takes home some hardware, which he is leading the race for.